Global cache is empty before you start a remote job using WAN accelerators for the first time. Global cache is corrupted and you want to populate it with valid data. In this case, you must clear the global cache first and populate it with new data before a remote job starts. For more information, see Clearing Global Cache. 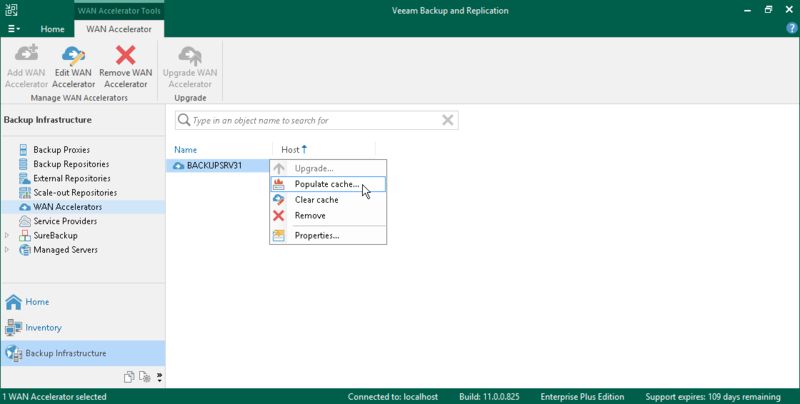 Veeam Backup & Replication does not use encrypted backups for global cache population. In the inventory pane, select the WAN Accelerators node. In the working area, right-click the target WAN accelerator and select Populate cache. If the selected WAN accelerator is not assigned as a target WAN accelerator to any remote job, Veeam Backup & Replication will display a warning. In the Source Backup Repositories window, select backup repositories from which OS data blocks must be retrieved. It is strongly recommended that you select backup repositories on the same site where the target WAN accelerator is located. In the opposite case, the traffic will travel between sites, which will increase load on the network.